For other uses, see Armadillo (disambiguation). Armadillos are New World placental mammals with a leathery armour shell. The Chlamyphoridae and Dasypodidae are the only surviving families in the order Cingulata, part of the superorder Xenarthra, along with the anteaters and sloths. The word armadillo means "little armoured one" in Spanish. The Aztecs called them āyōtōchtli [aːjoːˈtoːt͡ʃt͡ɬi], Nahuatl for "turtle-rabbit": āyōtl [ˈaːjoːt͡ɬ] (turtle) and tōchtli [ˈtoːt͡ʃt͡ɬi] (rabbit). The Portuguese word for "armadillo" is tatu which derives from the Tupi language. Similar names are also found in other, especially European, languages. About nine extant genera and 21 extant species of armadillo have been described, some of which are distinguished by the number of bands on their armour. Their average length is about 75 cm (30 in), including tail. The giant armadillo grows up to 150 cm (59 in) and weighs up to 54 kg (119 lb), while the pink fairy armadillo is a diminutive species, with an overall length of 13–15 cm (5–6 in). All species are native to the Americas, where they inhabit a variety of different environments. Recent genetic research suggests that an extinct group of giant armoured mammals, the glyptodonts, should be included within the lineage of armadillos, having diverged some 35 million years ago, much more recently than previously assumed. Today, all extant armadillo species are still present in South America. They are particularly diverse in Paraguay (where 11 species exist) and surrounding areas. Many species are endangered. Some, including four species of Dasypus, are widely distributed over the Americas, whereas others, such as Yepes's mulita, are restricted to small ranges. Two species, the northern naked-tailed armadillo and nine-banded armadillo, are found in Central America; the latter has also reached the United States, primarily in the south-central states (notably Texas), but with a range that extends as far east as South Carolina and Florida, and as far north as Nebraska and central Indiana. Their range has consistently expanded in North America over the last century due to a lack of natural predators. Armadillos have very poor eyesight, and use their keen sense of smell to hunt for food. They use their claws for digging and finding food, as well as for making their homes in burrows. They dig their burrows with their claws, making only a single corridor the width of the animal's body. They have five clawed toes on their hind feet, and three to five toes with heavy digging claws on their fore feet. Armadillos have a large number of cheek teeth, which are not divided into premolars and molars, but usually have incisors or canines. The dentition of the nine-banded armadillo is P 7/7, M 1/1 = 32. Gestation lasts from 60 to 120 days, depending on species, although the nine-banded armadillo also exhibits delayed implantation, so the young are not typically born for eight months after mating. Most members of the genus Dasypus give birth to four monozygotic young (that is, identical quadruplets), but other species may have typical litter sizes that range from one to eight. The young are born with soft, leathery skin, which hardens within a few weeks. They reach sexual maturity in three to 12 months, depending on the species. Armadillos are solitary animals that do not share their burrows with other adults. Armadillos are often used in the study of leprosy, since they, along with mangabey monkeys, rabbits, and mice (on their footpads), are among the few known species that can contract the disease systemically. They are particularly susceptible due to their unusually low body temperature, which is hospitable to the leprosy bacterium, Mycobacterium leprae. (The leprosy bacterium is difficult to culture and armadillos have a body temperature of 34 °C (93 °F), similar to human skin.) Humans can acquire a leprosy infection from armadillos by handling them or consuming armadillo meat. Armadillos are a presumed vector and natural reservoir for the disease in Texas and Louisiana and Florida. Prior to the arrival of Europeans in the late 15th century, leprosy was unknown in the New World. Given that armadillos are native to the New World, at some point they must have acquired the disease from old-world humans. The armadillo is also a natural reservoir for Chagas disease. The nine-banded armadillo also serves science through its unusual reproductive system, in which four genetically identical offspring are born, the result of one original egg. Because they are always genetically identical, the group of four young provides a good subject for scientific, behavioral, or medical tests that need consistent biological and genetic makeup in the test subjects. This is the only reliable manifestation of polyembryony in the class Mammalia, and exists only within the genus Dasypus and not in all armadillos, as is commonly believed. Other species that display this trait include parasitoid wasps, certain flatworms, and various aquatic invertebrates. Armadillos (mainly Dasypus) are common roadkill due to their habit of jumping 3–4 ft vertically when startled, which puts them into collision with the underside of vehicles. 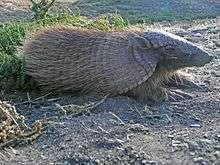 Wildlife enthusiasts are using the northward march of the armadillo as an opportunity to educate others about the animals, which can be a burrowing nuisance to property owners and managers. ↑ Karttunen, Frances E. (1983). An Analytical Dictionary of Nahuatl. University of Oklahoma Press. p. 17. ISBN 978-0-8061-2421-6. View entry at "ayotoch" in Nahuatl Dictionary, by the Wired Humanities Projects, Stephanie Wood (ed.) Retrieved 2015-07-22. 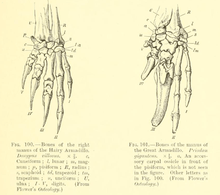 ↑ "Study finds relationship between glyptodonts, armadillos". AMNH. Retrieved 2016-02-22. 1 2 Woodburne, M. O. (14 July 2010). "The Great American Biotic Interchange: Dispersals, Tectonics, Climate, Sea Level and Holding Pens". Journal of Mammalian Evolution. 17 (4): 245–264 (see p. 249). doi:10.1007/s10914-010-9144-8. PMC 2987556 . PMID 21125025. ↑ "Armadillos slinking their way into Indiana". TheIndyChannel. The Associated Press. 7 June 2014. Retrieved 2014-06-16. 1 2 "Armadillos, Armadillo Pictures, Armadillo Facts". National Geographic. Retrieved 2015-07-22. ↑ McNab, Brian K. (November 1980). "Energetics and the limits to the temperate distribution in armadillos". Journal of Mammalogy. American Society of Mammalogists. 61 (4): 606–627. doi:10.2307/1380307. JSTOR 1380307. 1 2 Dickman, Christopher R. (1984). Macdonald, D., ed. The Encyclopedia of Mammals. New York: Facts on File. pp. 781–783. ISBN 0-87196-871-1. ↑ "How high can a nine-banded armadillo jump?". Everyday Mysteries: Fun Science Facts from the Library of Congress. Library of Congress. 12 February 2009. Archived from the original on 2009-12-06. Retrieved 2009-12-17. ↑ McDonough, Colleen M.; Loughry, W. J. (2013). The Nine-Banded Armadillo: A Natural History. University of Oklahoma Press. pp. 181–182. ISBN 978-0-8061-8921-5. ↑ Vijayaraghavan, R. (2009). "Nine-banded Armadillo Dasypus novemcinctus Animal Model for Leprosy (Hansen's Disease)". Scandinavian Journal of Laboratory Animal Sciences. 36 (2): 167–176. Retrieved 2015-07-22. ↑ Freeman, Patricia W.; Genoways, Hugh H. (December 1998). "Recent Northern Records of the Nine-banded Armadillo (Dasypodidae) in Nebraska". The Southwestern Naturalist. 43 (4): 491–504. Retrieved 2010-06-07. ↑ Bagatto, B.; Crossley, D. A.; Burggren, W. W. (1 June 2000). "Physiological variability in neonatal armadillo quadruplets: within- and between-litter differences". Journal of Experimental Biology. 159. 203 (11): 267–277. PMID 10804163. ↑ Billet, Guillaume; Hautier, Lionel; de Muizon, Christian; Valentin, Xavier (2011). "Oldest cingulate skulls provide congruence between morphological and molecular scenarios of armadillo evolution". Proceedings of the Royal Society. 278 (1719): 2791. doi:10.1098/rspb.2010.2443. 1 2 Harris, Gardiner (27 April 2011). "Armadillos Can Transmit Leprosy to Humans, Federal Studies Confirm". The New York Times. Archived from the original on 4 May 2011. Retrieved 2011-05-03. ↑ Yaeger, R. G. (March 1988). "The prevalence of Trypanosoma cruzi infection in armadillos collected at a site near New Orleans, Louisiana". The American Journal of Tropical Medicine and Hygiene. 38 (2): 323–326. PMID 3128127. 1 2 Schaefer, Joseph M.; Hostetler, Mark E. (January 1998). "The Nine-banded Armadillo (Dasypus novemcinctus)". University of Florida, IFAS Extension. Archived from the original on 2010-01-02. Retrieved 2009-12-17. 1 2 Loughry, W.J; Prodohl, Paulo A; McDonough, Colleen M; Avise, John C. (May–June 1998). "Polyembryony in Armadillos" (PDF). American Scientist. 86 (3): 274–279. Bibcode:1998AmSci..86..274L. doi:10.1511/1998.3.274. ↑ Hamlett, G. W. D. (September 1933). "Polyembryony in the Armadillo: Genetic or Physiological?". The Quarterly Review of Biology. 8 (3): 348–358. doi:10.1086/394444. JSTOR 2808431. Gardner, A. (2005). Wilson, D.E. ; Reeder, D.M., eds. Mammal Species of the World: A Taxonomic and Geographic Reference (3rd ed.). Johns Hopkins University Press. pp. 94–99. ISBN 978-0-8018-8221-0. OCLC 62265494. Superina, Mariella; Pagnutti, Noralí; Abba, Agustín M. (2014). "What do we know about armadillos? An analysis of four centuries of knowledge about a group of South American mammals, with emphasis on their conservation". Mammal Review. 44 (1): 69–80. doi:10.1111/mam.12010.